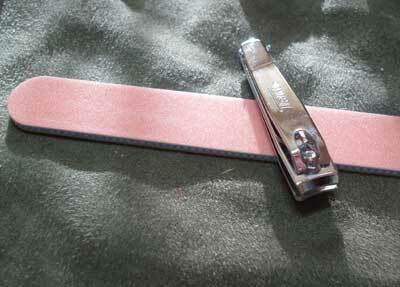 The article on the needle roll made out of felt sparked a couple questions about what I keep in my needlework toolbox. I never really considered carefully what should be kept in a needlework toolbox; instead, my collection of tools has grown pretty much out of need. It’s an eclectic bunch of little things, all of which I have found use for in varying degrees of frequency. 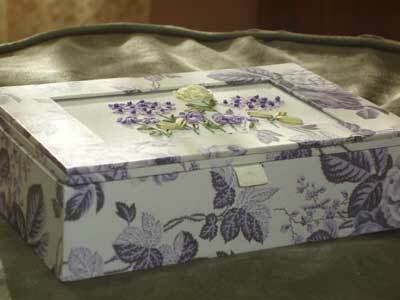 No doubt, the ideal contents of a toolbox will vary among embroiderers. 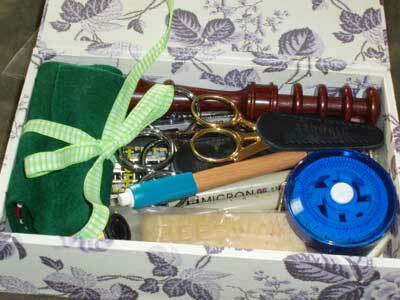 This is my stash of tools that I keep encased in a box in my embroidery basket. Upon first opening the box, this is what you see – a more or less generally cluttered disarray of stuff. There are, of course, scissors. I have eight pairs of scissors, but only three that I use regularly. One is used exclusively for goldwork, and the other two are used interchangeably for snipping threads and bits of fabric. There are three measuring instruments: a small retractable tape measure (courtesy of Hedgehog Handworks), a 6″ x 1″ quilter’s ruler, and a hem measurer (for lack of the correct name of that thing). 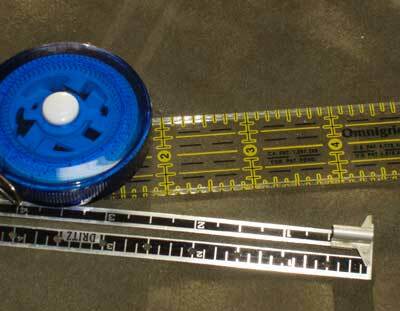 I use them all pretty frequently, but probably the hem measurer and quilter’s ruler most often. You’ll also find some… well, tools, for lack of a better categorical name. From top to bottom: tweezers, a laying tool, a tiny crochet hook, and a mellore all get used pretty frequently. 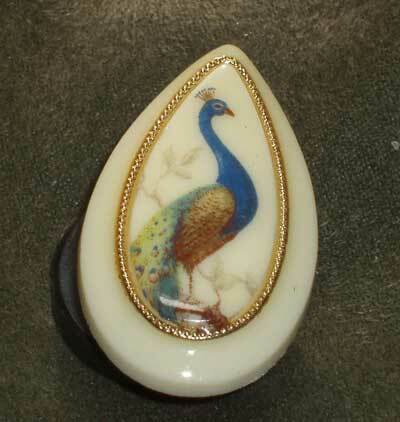 I use tweezers to manipulate goldwork thread, to pick up tiny things, to pull out thread bits, and so forth. The laying tool (with a sharp tip that can be used as an awl) is used to keep threads in line. The crochet hook comes in handy for pulling threads through in tight spots. And the silver mellore is used to manipulate metal threads. 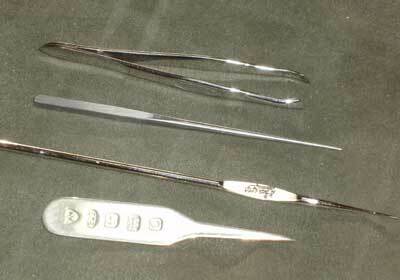 I keep some very large needles on hand – these are upholstery needles. I don’t use them much, but they come in handy for lacing up fabric and so forth. The needlethreader is rarely used, but I do admit that in a tight spot, for teeny tiny needles (minute beading needles and sometimes a #12 crewel), I use it if I need to. And you can also see a bunch of cotter pins that anchor the slats on my slate frame. 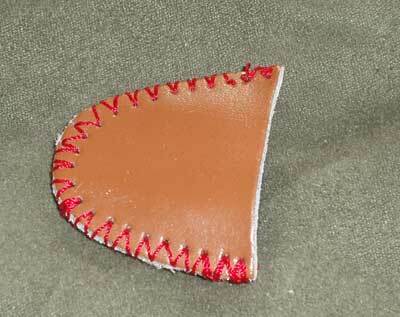 This is a leather thimble. I never use a thimble, normally, but sometimes, if I’m working on something that’s tough to get a needle through, I do slip this on for extra protection on my middle finger, which is the finger I generally use for pushing my needle. I have a permanent callus on that finger from my needles, but if I’m using a smaller needle, it often has the uncanny ability to find the one weak spot in the calloused area, where it decides to slip eye-first into my finger. That can be painful. So now and then, and leather thimble can be helpful. I keep three types of pencils and pens in my toolbox: two are micron art pens, one is a mechanical pencil, and the other is a white chalk pencil for marking on darker fabric. You just never know when you might need to make an adjustment in a pattern or draw something on a piece of fabric. I use all three of these fairly often. 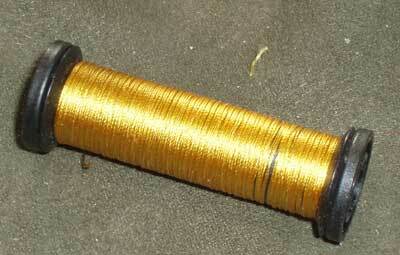 This is a spool of silk couching thread that I use for goldwork. I don’t know why I keep it in the box, but I do. I think it’s just so that I have some thread in there. This is a magnetic needleminder. All my metal tools in the box find it at one point or another. I use this on larger projects where I might have several threaded needles going at once. Right now, I’m not working on any large projects, so it’s in the box! 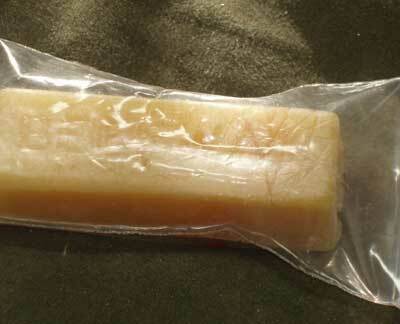 This is a brick of beeswax for waxing threads, especially for goldwork. You never know when the urge to wax your thread might strike! But when you’re working with metal threads, most of your couching thread will need a nice coat of wax on it. I love beeswax. I like the smell of it! This beautiful tool was treat. I bought it when Twining Thread was still in business. I miss Twining Thread! This is called a Soldier’s Friend. It’s made out of the slickest, smoothest, prettiest wood. Around the notches, you can wind extra lengths of thread, and the end comes off the handle to provide a storage place for needles. I don’t “use” it a lot, but until the other day, I did have thread wound on it. Isn’t it pretty? It’s probably the most decorative of my tools, and the least used. But I do like it, and I have used it, so it’s not really just a decorative, non-functional tool. 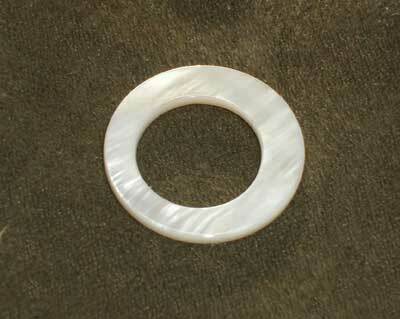 This is a mother of pearl thread ring. I usually have six or so of these floating in the bottom of the box, either in the large size or the small size. But right now, I’ve got the rest of them trussed up with thread. And, finally (you might find this odd! ), I keep fingernail clippers and an emery board in there, too, for smoothing or clipping fingernails when they become snaggy. I don’t like sitting down to embroider, only to discover a chipped nail before I start, and then having to go find these two items! So I bought a set specifically for my tool box, and you’d be surprised how often I actually DO use them! They’re great to have right on hand! e-down with all that stuff in it, so if it tips over or is knocked off the couch, or whatever, it usually stays tightly closed. I have other tools that aren’t kept in this box. In fact, I have two more similar boxes, but I don’t use them much, and the tools I have in them aren’t as serviceable as those shown here. So that, my friends, is what I keep in my box. What do you keep in yours? Is there any item you’re surprised I don’t have? Or anything here you think particularly odd? Out with it! Let’s talk tools! I love your ‘tool box’, it’s so very much like my own, including the nail file (I never use clippers on my nails, it breaks them). I also have a bit of felt with a few straight pins for pinning pieces together and such, a yellow marker in case I need to mark something on a chart, a six by six square of paper marked with a grid in case I need to chart my initials in the established style or change a little something on the existing chart, and a piece of hard candy — just in case. Did you know the Solider’s Friend was actually used as a sewing kit and included in their gear by soliders in both WW1 and II, and the Civil War and at least as far back as the Spanish American War? Back then each solider was responsible to keep his uniform stitched up and buttons sewn on himself. Where did you get the needleminder and the thread ring? The tools are very nice. 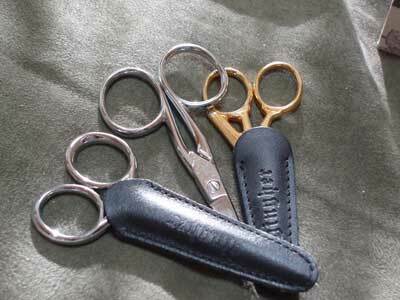 Surprised that the scissor sheaths are plain! I figured you would add something to them! Love the photos. Thanks. I decided I’d pull out my little traveling tool box to see if there’s anything different in it. The box itself is clear plastic with a little tray you lift out. I have some of the things you do but not larger items like pens or emery board. I carry a lot of laying tools, however. I have a short wooden one, my BLT which is the metal American version of the tekobari, a bone one, and a metal nutpick from a nutcracker set which is my ribbon laying tool. I also carry a metal thimble and my guild membership pins so I can put them on just before meetings. Except for my laying tool obsession and my membership pins, our toolboxes are very similar! What a pretty tool box! I am surprised you don`t have one thing I use a lot…pins! 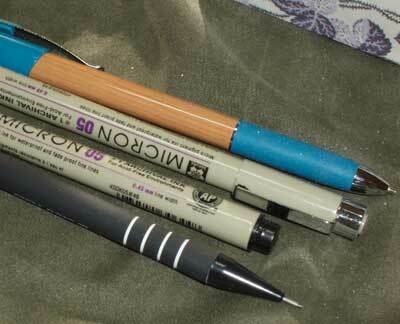 I use them for marking, Holding excess material out of the way and counting. I don`t have a tool box, mine is more a tool kit…I made it from linen and cross stitched it. It holds four pairs of scissors (one for clipping threads,a pair of all purpose ones, one for ripping and another pair for Hardanger) a laying tool, a bone awl, needle threader, nail file, scissors fob, pin cushion, needles and a small pinkeep with multi coloured pins. It`s been everywhere with me, from England to Colorado. I can`t stitch without it. Hi, Yoyo – Thanks for the info on the Soldier’s Friend. I think it’s really beautiful, and it’s nice to have a history of it. I knew its history stretched back to the Civil War days – I figured it was a kind of Civil War replica – but I didn’t realize it was also widely used in the world wars! 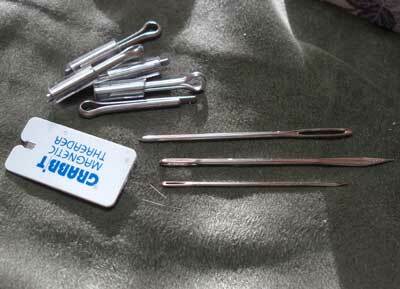 Hi, Laura – I got the thread rings and the needle minder from Stitching Bits and Bobs… you can find them online! I think they were one of the lesser expensive suppliers, and their service is really good. I know, plain sheaths. Who woulda thunk it? I like them plain! The scissors are seldom in them, anyway. I always forget, unless I’m putting the scissors in a bag…. MJ – oh, I do have a box of pins, but they are all occupied, pinning pattern pieces to the tote bag I’m making my mom for Christmas. In fact, I never have enough pins! The box I have holds 75 small glass head pins, and their all quietly waiting to be removed from the linen fabric for that bag that I guess I better sew up this week some time! But yes, you’re right. Pins. I forgot to mention them, but they’re usually there! Thanks for reminding me! Thanks, all, for the comments! Glad to hear from you – and I’m Really glad I’m not the only one “into” tools! Dang. I spelled “they’re” wrong in the comment above. I must be on vacation… ain’t it wunnerful? Years ago at a quilt show I found a very handy bag. It was made from a placemat (navy blue) with a multi ribbon handle. It had 3 or 4 of the zip lok bags sewn down the middle. It closes with velcro. I have used this bag constantly and it is packed full with all my stuff. Needles of all sizes, pins in felt, scizzors,every tool I have is inside there. It is actually bulging. Probably should be cleaned out now I think of it. I grab it when we leave for Florida or back to Illinois. Right now it is in Florida patiently waiting for me. Enjoy your vacation. It is time well earned for any teacher and a very Merry Christmas with your family and friends. I can imagine the oohs and aahs when they see their gifts from you. I pretty much have similar items to you all really but do have a geologist's loup, a small bottle or dry eye solution, some shell thread winders, a long pokey thing with a little hook on the end, a star de-tailor and another very fine pokey thing with a small latch hook arrangement on one end,(all pokey things born out of a quest for the perfect stray thread & finishing tool – the star de-tailor wins), an altoids gum tin containing a variety of threaders, a pricking tool for embroidery on paper, the usual array of laying tools, scissors, tweezers, pins and tape measures, a needle nest and needleholder from Daystar Handworks, some collapsible eye needles, a bone paper folder and a small pot of Thread Heaven which I am not sure about the long term consequences of using so I use it sparingly. I would be interested to hear what you think about the Thread Heaven. That was really kind of you to lay out the contents of your toolbox for inspection! I was one of the people who asked about it because I have started embroidering in the last year (some thirty years after I learned the basics at my grandma’s knee) and as I go along I am starting to ask myself what I really need to spend (ie how little) to get serious enough for it to be satisfying. Also what tools would an experienced needlewoman prioritise? So this was really helpful to me – and comforting – it doesn’t look too expensive, amd I have already got quite a lot of that stuff (bar the metallic tools, i.e. mellore, etc). But I must get a nice box now! My tools are all over the place! Thanks a lot for this inspiring tour of your toolbox! Mary, I have sewing BOXES, because I can’t keep everything in one kit. I have a tin for my metal thread tools which aren’t used on any other type of embroidery. Then there’s my general embroidery box, my sewing (as in dressmaking) box and then a box full of all the larger bits which won’t fit into any of the other boxes. I usually have to juggle some tools when I go to workshops, and I always manage to take way too much. But then I’m known as the “tool lady” , and if someone has forgotten something, I usually have it in my kit, LOL. 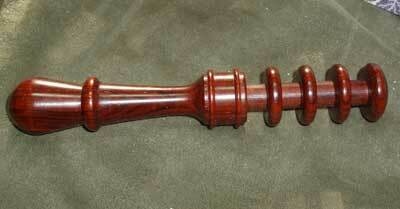 The hem thingamy is a hem guage, and is useful for all sorts of repeated measures. I tend to use marked up bits of cardboard from tea packets though, as I can iron over them and they don’t stay hot enough to burn your fingers while in use. My other 2 favourite tools are a long pair of overlocking tweezers, which can be used to turn through points in hard to reach places, and a bamboo satay skewer. I use that to hold down bits I don’t want to pin while I sew them down with the machine. The bamboo may shatter if a needle hits it, but no damage really done, and no sewn fingers ! I have a couple of different thimbles for hand sewing and embroidery, but like you I don’t often wear them. And yes, I can confirm that being continually punctured by the eye of a needle HURTS. At least I’m not taking Warfarin anymore, which used to result in a spurt of blood getting on the work. I learned pretty fast to chew some cotton thread to make a cleaning ball! You have a wonderful tool box! I especially like the idea of a nail clipper and emery board in it. I never thought of putting those in my hand work box, but I know there have been several times when I’ve sat down to work and had to get up again to file a nail. I’m putting those items on my shopping list for my box. I love the design of your box. It is very pretty. What could be more fun than looking at another stitcher’s tools? I love the soldiers friend. I have many of the same things (love beeswax!). One of my favorite, can’t-live-without tool is a “zinger” for my scissors; it clips to my shirt and has a retractable cable so my scissors are so easy to grab. I can’t live without it. OH how satisfying seeing all your tools like that! Somewhere on your site you give a list of all the major online resources you most often use and recommend. I cannot seem to find this now. Though I have stumbled on it a few times. Can you tell me where that list is? Thanks so much. Hi, Ann – you’ll find a list here: https://www.needlenthread.com/books-links#bpembsupplies Additionally, the advertisers in the side columns on my website are all excellent resources! Regarding my last, I mean the sellers, like Hedgehog, Needle in the Haystack, Nordic, Laic, and others. I am searching for that full list you have somewhere. Next Next post: Put up Your Needlework!